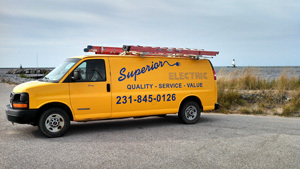 Superior Electric has been serving the Mason, Oceana, and Manistee counties for the past 25 years. For your residential or commercial electrical project you need the security of a company that is licensed, insured and experienced. The owners, Jeremy and Tina Schad, can provide you with just that. Whether it is new construction, remodeling, electrical upgrades, or troubleshooting, call Superior Electric for service you can trust. Quality...service...value. Three words that still mean something to the folks at Superior Electric of Ludington. They believe in doing quality work at a fair price. They offer a high level of professionalism, with skilled technicians who work with you, and don't talk at you. Respect for their customers and the job at hand is what sets Superior Electric apart from the rest. They have a strong work ethic that keeps customers coming back. Your satisfaction is important to them, and they continually strive to get the job done on time and on budget. There is a lot to consider when building a new home, and wiring is one of the most important details. 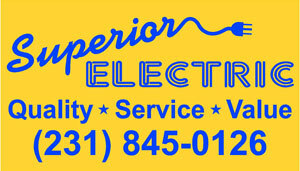 Superior Electric has the expertise to help plan your wiring system to meet your individual needs. From switch placement and lighting layout, to receptacle locations and low voltage systems...they can assure an end result that exceeds your expectations. Call Superior Electric to help plan your remodeling project and offer suggestions to make your electrical system safe and more functional. By bringing their expertise into your remodel planning you can be sure it will be done right the first time and save you from costly repairs and changes down the road. They can replace or relocate existing wiring to accommodate your renovation plans. Remember to always use licensed and insured contractors like Superior Electric to help you transform your home into the home of your dreams. If you own a business or commercial property, Superior Electric can help you with anything from electrical maintenance, repair and new construction to energy efficiency. Whatever your electrical needs, we are here to serve you. 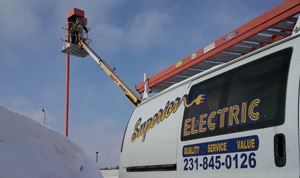 Small jobs are no problem for Superior Electric. Perhaps you have a bad light switch or a receptacle not working? Our professional team will quickly and efficiently diagnose and correct the problem. We also repair electrical storm damage, install portable and fully automatic generators, transfer switch equipment and perform electrical service and panel upgrades. Whatever your electrical needs, we are here to serve you. No matter what your electrical need is, with Superior Electric you are guaranteed a quality service provided by a licensed, experienced, and trustworthy technician.